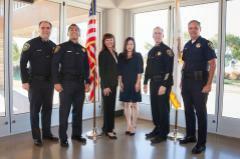 On Monday, January 6, 2014, Chief Henisey welcomed several new employees to the UC Irvine Police Department during a ceremony held at the University Hills Community Center. Family members, friends, and department personnel congratulated Officer Alex Bicomong and Administrative Specialist Christina Park. Officer Alex Bicomong transferred to UCIPD after serving as an officer at the UCLA Police Department for 14 years. During his time at UCLA, he worked in the Patrol Division and also held assignments as a Field Training Officer, Use of Force and Defensive Tactics Instructor, and Background Investigator. As a background investigator for the Personnel and Training Division, he helped coordinate recruitment, testing, and training in order to help aspiring police officers get a foothold in the career of law enforcement. Officer Bicomong holds a Bachelor’s degree in Criminal Justice Management from Union Institute and University. Administrative Specialist Christina Park graduated from the University of California, Irvine in 2010 with a Bachelor’s degree in Anthropology. After graduating from UCI, she worked in South Korea at a scuba diving company as an International Business Manager and Language Interpreter for several years. After accomplishing her goals at that company, Christina returned to California and the UCI community. She was employed by UCIPD in a temporary position before accepting a full time position in the Administrative Unit. Receive updates directly via email by registering at http://Nixle.com/ and search for "UC Irvine Police" or text "UCIrvinePD" to 888777 to receive text message alerts only. Standard text messaging rates may apply depending on your calling plan.